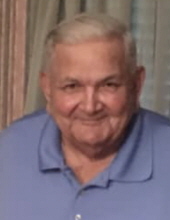 Mr. Elmer Ray Chavis, 75, of Pembroke, went to be with his heavenly father on February 2, 2019 surrounded by his loving family. He was born to the late Joe and Alice Anderson Chavis on April 15th, 1943. He joins in Glory his parents; three siblings; Mergie Strickland, Joe Chavis Jr., and Delton Chavis. Mr. Elmer Ray was a charter member of Friendship Missionary Baptist Church where he served as a trustee. He used his talents of carpentry to help construct the original sanctuary of Friendship Missionary Baptist Church. Mr. Chavis spent his life working as a barber, a farmer, a carpenter, as well as hard wood floor refinisher. He was a man who found joy in a hard days work. During his years of retirement Mr. Chavis was a devoted care taker of his wife Vietta. He also spent his time visiting the sick and shut in. Mr. Chavis could be found daily chatting with his friends at his favorite spot Cozy Corner. He always had something funny to say and was the kind of man who never met a stranger. Many people in the community have enjoyed a laugh or two with Elmer Ray. Mr. Chavis leaves to cherish his memories his lovely wife of 54 years, Mrs. Vietta Chavis of the home; three sons; Mr.Kent Chavis and wife Doris, Mr.Eric Chavis, and Mr. Derrick Chavis; three beautiful granddaughters: Mrs. Courtney Hobbs-Chavis (Kristen), Mrs. Brianna Chavis-Locklear (Ian), and Ms. Morgan A. Chavis; two brothers: Mr.Donnie Chavis (Linda) and Mr. Roy Chavis (Glenda); a special nephew, Mr. Chris Strickland (April); a special cousin, Mr. Raybon Maynor (Sue Ann); and a host of relatives and friends. The family will receive friends from 7-9 P.M. on Tuesday, February 5, 2019 at Friendship Missionary Baptist Church. To send flowers or a remembrance gift to the family of Elmer Ray Chavis, please visit our Tribute Store. "Email Address" would like to share the life celebration of Elmer Ray Chavis. Click on the "link" to go to share a favorite memory or leave a condolence message for the family.